If you’ve read my feature about the Nintendo 64’s library of comic books games, you’ll know that there wasn’t that many released from the time in launched in September of 1996 to the time its last game, Tony Hawk’s Pro Skater 3, arrived in 2002. Technically speaking, there were eleven video games with comic book properties released on the system counting the Spider-Man cameo in Tony Hawk’s Pro Skater 2 and Wolverine in Tony Hawk’s Pro Skater 3, but for the purpose of today’s list, I’m excluding those two and focusing on the games that were purely based on comic books and not games that featured cameos. This is the official Comic Gamers Assemble worst-to-best list of the comic book games released on the Nintendo 64. 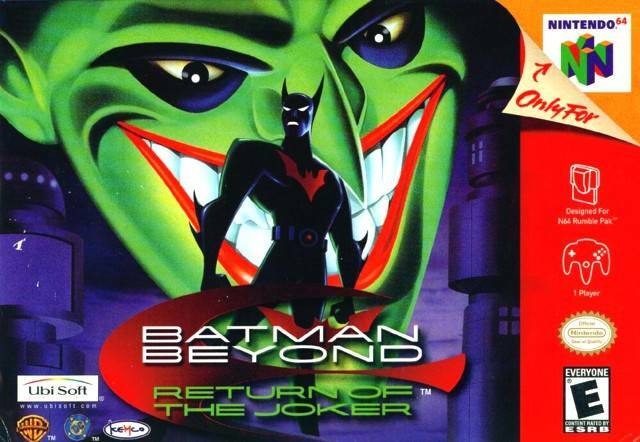 Many would claim Superman 64 is the single worst Nintendo 64 game, but those who say that probably never played Batman Beyond: Return of the Joker. Superman 64, while bad, in my opinion has a “so bad, it’s almost good” feel where at the very least you can laugh about it; Return of the Joker doesn’t even have that going for it. I’ve played and finished a lot of bad games for review for this site, but I haven’t managed to get farther than the first two-to-three levels of Batman Beyond before throwing in the towel. The best thing I can say about this game is that the black cartridge it comes in looks pretty cool. 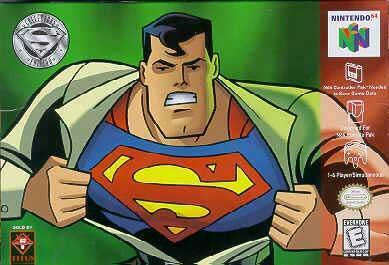 Superman 64 is better than Batman Beyond: Return of the Joker, but that’s not saying very much. I’ve managed to finish Superman 64 on its hardest difficulty, the only way to actually see its true ending, and it’s as bad as people say it is. You can get used to the flight controls and the flying through ring “ride” stages are more long than difficult, but the numerous bugs, terrible graphics and collision detection and often long levels with no checkpoints only make this for the biggest Superman fan or the most dedicated. That all being said, I do weirdly enjoy this game because of how bad it is. 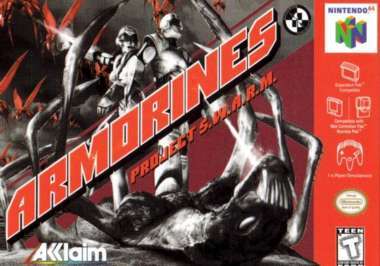 The idea of being a space marine, mowing down waves of alien bugs in a game using the same engine as the Turok games should have made for a great time, but Acclaim should have maybe held this property for the wave of consoles that came after the Nintendo 64. The bugs are too few in number to be threatening, and the enemy and weapon variety comes nowhere close to any of game in the Turok franchise. The worst thing about this game though is how poorly the lighting is within the game’s levels. You’ll spend more time randomly shooting around just trying to see more than actually engaging in combat with enemies. There’s way better shooters on the Nintendo 64, some of which will appear on this list. This console generation has proven that multiplayer only games can be big hits, just look at games like Titanfall and the recently released Overwatch. Back in 1999, the concept was a bit tougher to sell, which is why Turok: Rage Wars can only be remembered as a foot-note in our multiplayer obsessed present. Four-player first-person shooter death match modes were huge on the Nintendo 64 because of the four built-in controller ports, but a lot of the games people played that had those modes also came with memorable single-player campaigns. Rage Wars tried to have a tournament mode that made it similar to a fighting game’s arcade mode, but it was nowhere near as fun as just plugging in either of the two games that came before it. Or it could be as so eloquently put in a comment in my review of the game “You obviously didn’t have any friends over to play it the multiplayer…”. Is Turok 2 a bad game? By all means no, it’s actually pretty good, it’s just that it’s very bloated. Turok 2 suffers in a similar way that a lot of sequels did on the Nintendo 64 in that developers just took what worked and just crammed more stuff in. If you liked the original Turok: Dinosaur Hunter, you’ll probably like its sequel with its much approved AI, presentation, larger levels and crazy weapons, but the game collapses under its own weight. The stages are too long and most have to be repeated with checkpoints spaced very far apart. Hopefully the upcoming HD remaster of Seeds of Evil will make it a much more reasonable game to pick up and play. 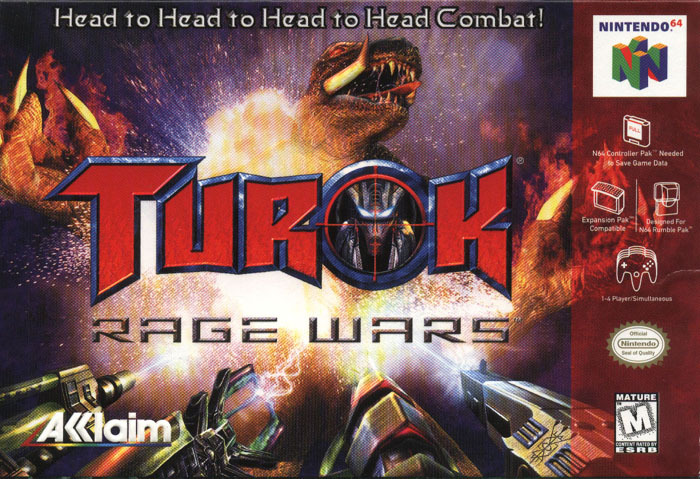 At at a time when companies were moving to new hardware like Sega’s Dreamcast and Sony’s PlayStation 2, Acclaim stuck with the N64 in its twilight years and delivered not only one of the last best games on the system, but the first truly great Turok sequel. Shadow of Oblivion loses some of the mythology and lore that made the first two games feel unique as its mostly set in what we would call the real world, but its shorter levels, two playable characters and focus on action make it a much more enjoyable game overall than Seeds of Evil. Given the time it was released, people may not be as familiar with this chapter in the Turok trilogy, but if you liked either of the other two, you owe it to yourself to give this one a shot. 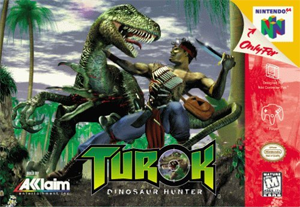 Turok: Dinosaur Hunter was one of the Nintendo 64’s first big hits and despite not holding up graphically with its blankets of distance fog nor in the controls department, it nonetheless is one the best game in the franchise and one of the best comic book games to grace the N64. Like Super Mario 64, what makes the original Turok: Dinosaur Hunter so good is its large, open worlds that are ripe for exploration. A far cry from today’s corridor based shooters, Turok: Dinosaur Hunter encourages the player and rewards them with keys needed to progress and a buildable weapon with enough destructive power to make even the largest bosses feel like they’re just cannon fodder. While the sequels had better graphics, AI, rumble and expansion pack support, the original game in the franchise beats them by exercising restraint and not taking itself too seriously. The levels are big and there’s a lot of collectibles to find within them, but not to the point where it becomes a chore. 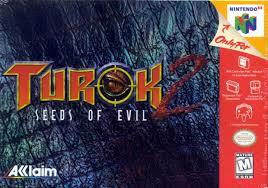 Turok 2: Seeds of Evil and Shadow of Oblivion also went too far on the “M for Mature” sign and got pretty dark. There’s plenty of blood and destruction in Turok: Dinosaur Hunter, but it’s still funny at the same time, especially the way enemies dance and scream when they’re shot in certain areas of their bodies. I’m going to keep this short because between the PlayStation version of this game and the superior Dreamcast port, I’ve lauded enough praise on this comic book games classic. Though it lacks the presentation value of its contemporaries and the N64 controller is nowhere near as comfortable to play this on as the Dualshock or Dreamcast controller, you still get everything found within both of those games. The campaign is short, but tight, featuring a great story that pays a great deal of respect to the source material. The play length can be extended by tracking down hidden comic book covers, costumes, and playing on higher difficulties. 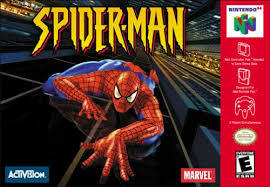 If you’re a fan of Spider-Man, regardless of what system you have, you’ve already played this already, but if you haven’t, make it the next game you play. Being an N64 owner in 1999 who was very envious of those who had PlayStation’s, I wanted to play something more mature than what Nintendo usually offered, complete with a deep story and voiced cut-scenes. The game that has that and so much more is also the best comic book game released on the Nintendo 64: Acclaim’s Shadow Man. 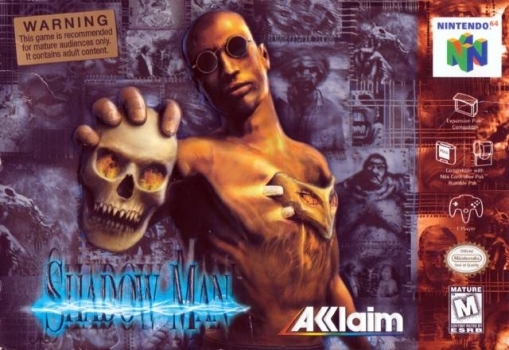 Even if you know nothing about the property, which admittedly even I still don’t, all you need to know is that if you love games like Metroid, you need to at least give Shadow Man a try. It can be confusing, and at times difficult to navigate, but once you get a feel for the creepy world of Deadside, you’ll be crisscrossing back and forth in no time in search of collectibles, weapons and power-ups. 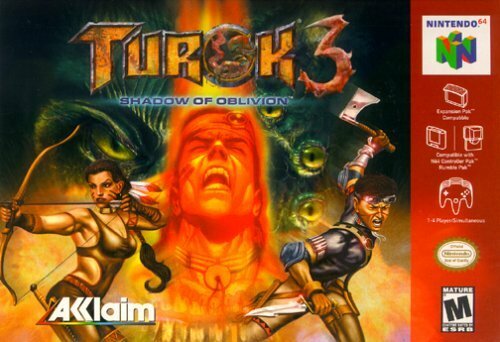 If you don’t have in your possession one of the consoles that this game appeared on, it too like the first Turok game and its upcoming sequel has been remastered and available to download on PC.